The Sustainable Business Network of Greater Philadelphia (SBN) & EnergySage are partnering to bring Solar to Philly! At SBN, we are committed to setting an unprecedented example for how businesses and communities can coexist, collaborate, and create a more sustainable society. SBN is working with local solar installers, city government, and environmental advocates to bring solar to homes and businesses in the Philadelphia region. As part of this effort, SBN has partnered with EnergySage to offer you a simple and easy way to go solar. 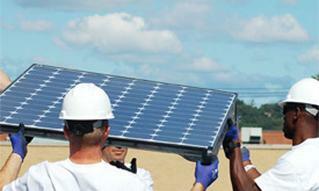 Solar does more than save you money—going solar also creates local jobs and preserves our natural resources.